Blaze Foley isn’t a name that you hear very often. An eccentric country singer-songwriter with a penchant for duct tape, Foley was born in Arkansas as Michael David Fuller, and raised in Texas where he grew up performing with his family. He was a contemporary of musicians like Willie Nelson, Merle Haggard and Townes Van Zandt, who was a frequent collaborator of his, and recorded some incredible songs throughout his all too short career, which was marked by drunkenness. But Blaze never got the fame that he deserved, despite a short time spent on the road performing at bars in different cities, and some of his material was only released posthumously, when the lost recordings were discovered by those who knew him. You see, Foley’s life was cut short in 1989 when he was shot and killed by his friend’s son, when he tried to stop him from stealing his father’s welfare check, providing a tragic end to his story before more people even got to know him. 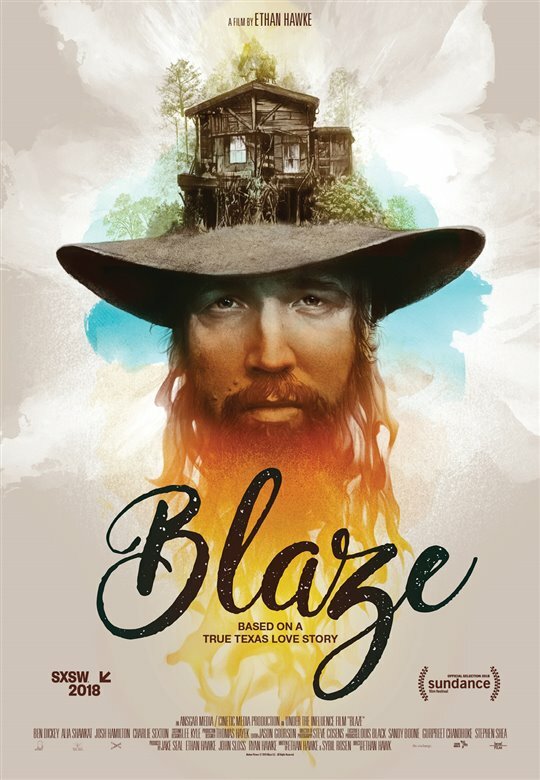 Now he has been resurrected anew in the film Blaze, in which he is portrayed by fellow singer-songwriter Ben Dickey, in a remarkable debut performance. Dickey perfectly captures the larger than life persona of Blaze Foley, while also bringing a remarkable sense of vulnerability to his portrayal that is quite moving to watch. Directed by Ethan Hawke, delivering another deeply personal ode to a little known musician following his wonderful 2014 documentary Seymour: An Introduction, Blaze is technically a biopic of Foley, but it plays more like a collection of moments from his life, shot through an observational lens. The result is sort of like the cinematic equivalent of a concept album, that paints a complete picture through a series of separate songs. There is a free flowing quality to the storytelling here, like a melody that is made up of familiar chords, but Hawke keeps finding new ways to arrange them. It’s the idea of country music as “three chords and the truth” applied to filmmaking, stripping the story down to its essentials to offer maximum feeling and emotional impact. The film deconstructs the usual biopic formula, with a loose, fractured narrative that keeps circling back to a few key moments that serve as through lines to his life. These include Blaze’s final performance at an Austin, Texas dive bar, which is being recorded live on tape reels that he brought himself; and a lazy afternoon spent jamming on his friend’s porch, which will ultimately become the site of his demise. Finally, the film centres itself around a radio interview that Townes (Charlie Sexton) and another musician named Zee (Josh Hamilton) – a fictional, composite character – are doing after his death, sharing stories about his life to a DJ (Hawke) who has never even heard of him, including a stranger than fiction tale about digging up his grave to retrieve the pawn slip needed to get back his guitar. But these moments work as much more than just framing devices, instead providing the rhythmic backbone of the film. The biggest narrative thread that ties them all together is Blaze’s relationship with Sybil Rosen (Alia Shawkat), a young Jewish woman that he met while living in an artist community in Georgia. His time with her would define much of his work, with their relationship starting off as idyllic, before ending in heartache. Rosen’s own memoir Living in the Woods in a Tree: Remembering Blaze provides much of the basis for the film, and she also co-wrote the screenplay with Hawke. The first song that we hear performed in Blaze is a beautiful and haunting track that he wrote called “Clay Pigeons”, which is fitting because it’s a song that we only need to hear a single time to get permanently hooked on Foley’s music and want to hear more. There is a sense of sorrow running through the entire film that’s as deep and melodic as any country song, with a story that takes us through the heartbreak of love found and lost, before ending in tragedy. Hawke keeps himself pretty much entirely behind the camera, appearing in the film as the radio host but never showing his face, and this feels like an appropriate artistic choice so as not to overshadow his main subject. The point of Blaze is to pay tribute to a great voice that was taken from us far too soon, and the underlying sadness of the film is matched by a bittersweet sense of joy that comes from the feeling of discovering his work. I had admittedly never heard of Blaze Foley before this film, but I sure am glad Ethan Hawke has introduced me to him now. Blaze is now playing in limited release at Cineplex Cinemas Yonge-Dundas in Toronto.